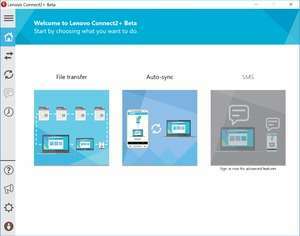 Lenovo Connect2 is a free file transfer utility which can synchronize, share and transfer files between different devices like Android tablets, phones and Windows computers. The application can be useful for sharing all types of files across a WiFi network including photos, videos and even Android apps. No Internet connection is required to use Lenovo Connect2; You can use the QR Code scanning system on your phone or tablet to set it up. The application works with Windows, Android and iOS for Apple devices like iPad and iPhone. Version 4.2.5.4885 is a freeware program which does not have restrictions and it's free so it doesn't cost anything. For security reasons, you should also check out the Lenovo Connect2 download at LO4D.com which includes virus and malware tests. Additional screenshots of this application download may be available, too.